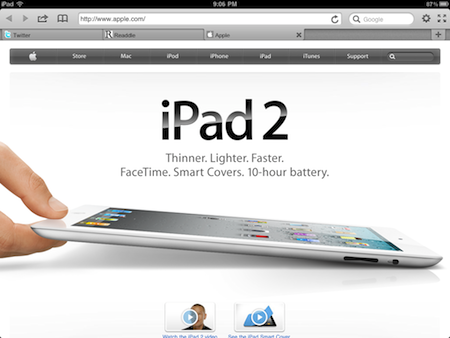 iPad Web Browser with Full Screen view and Tabs! 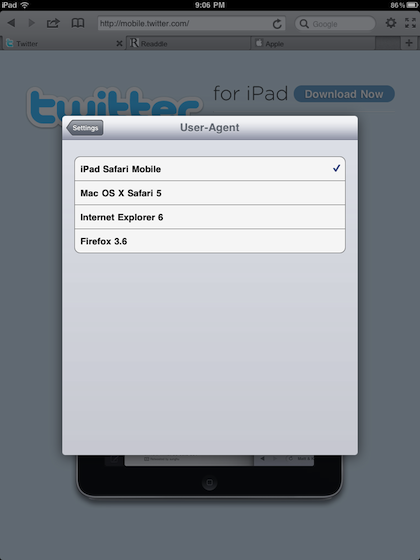 There is a split around the office if the iPad’s internal Web browser is great or not. It is definitely designed as a mobile browser rather than a desktop browser crammed into a tight spot. People are mixed with the screen of individual browser page views and it’s limit to the number of pages being able to be open at a time. It makes sense if you remember what you actually have in your hands… a very thin computing device controlled completely with your finger. For many folks though, they want and may actually ‘need’ something more like what they have on their desktop computer. For those folks, Readdle has released a new browser for the iPad, the Terra Web Browser. The browser works equally well in portrait and landscape views. Think of it as a desktop browser that works on the iPad, there will be no side navigation bars or features that you would expect with a iPad app going from portrait to landscape views. 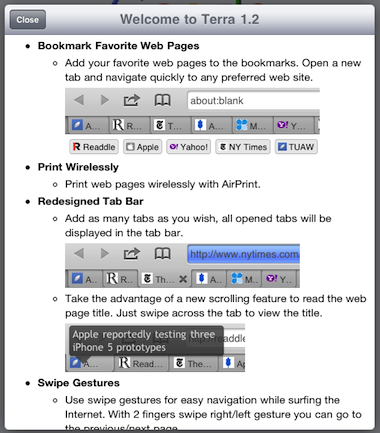 The features that jump off the page in the above view is ‘Tabbed Browsing’! And, if you notice the little arrows in the upper right corner, the four arrows, makes the Terra Browser pops into full screen view. 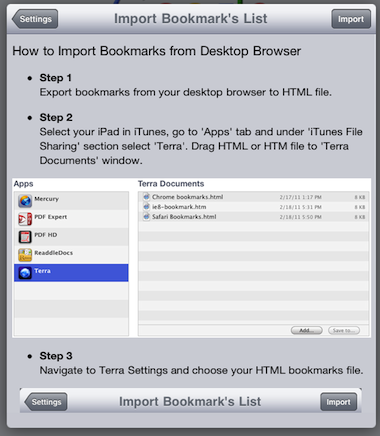 Grabbing your desktop’s bookmarks to use in the Terra Browser on the iPad is done through the iTunes sync. The ‘Share’ button in the Terra Browser has more than what you would normally see. 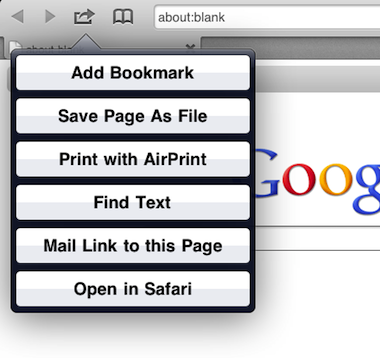 It provides a way to save the page for offline viewing, searching the page, printing and sharing the page via email. For the ‘serious’ browser user, the Terra Browser lets you set how the Web page your visiting sees your computer. Many sites adjust their output depending on the device that is looking at it. By moving to another option in the Settings area, you can see how the page looks if you were viewing the site with a variety of other browsers. This can effect which features you see and a must if your writing your own site. The settings area of the Terra Browser looks much like a desktop browser list of options too. Cleaning up cookies/history as well default search and security. 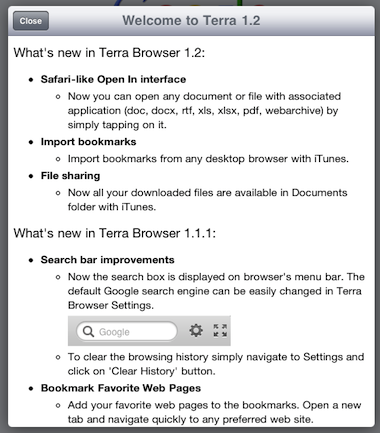 The ‘What’s new’ is available within Terra Browser for more detail on features we didn’t go into above that you might find interesting.